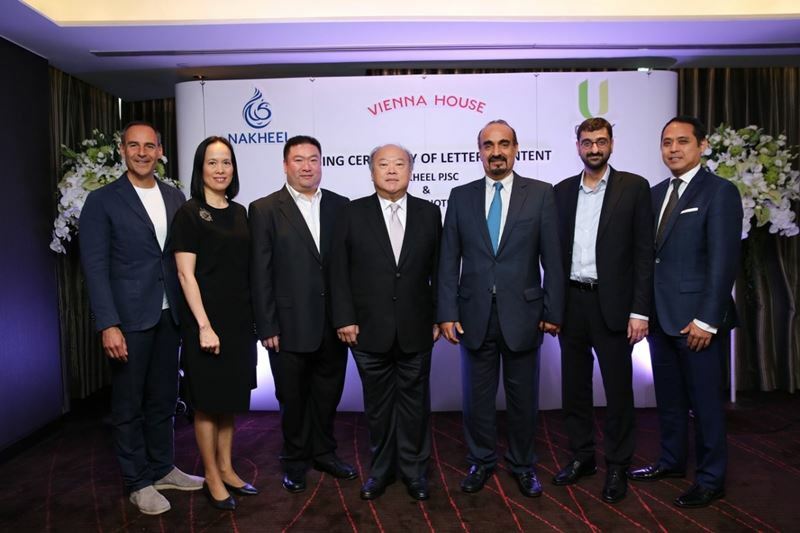 Mr. Keeree Kanjanapas, Chairman of U City Public Company Limited recently chaired the Letter of Intent (LOI) signing ceremony between its subsidiarity – Vienna International Hotelmanagement AG and Nakheel PJSC to develop a new beach resort on Deira Island, Dubai, United Arab Emirates. Top executives who joined the event include Mr. Kavin Kanjanapas, Director, U City Public Company Limited (Third left), Ms. Piyaporn Phanachet, CEO of U City Public Company Limited, (Second left), Mr. Ali Rashid Ahmed Lootah, Chairman of Nakheel PJSC (Third right), Mr. Rupert Simoner, CEO of Vienna International Hotelmanagement AG (First left), and the management team from Nakheel PJSC. The LOI signing ceremony was held at the Eastin Grand Hotel Sathorn, Bangkok.